The beloved classic King Kong (1933), starring Fay Wray, revolved around an expedition to an uncharted island in the Indian Ocean inhabited by an array of prodigious prehistoric creatures. The explorers proceed to capture and cage a gigantic ape with plans to put him on exhibition in New York as the 8th Wonder of the World. He eventually escapes and wreaks havoc around the city before scaling the face of the Empire State Building during one of the most iconic climaxes in the annals of cinema. 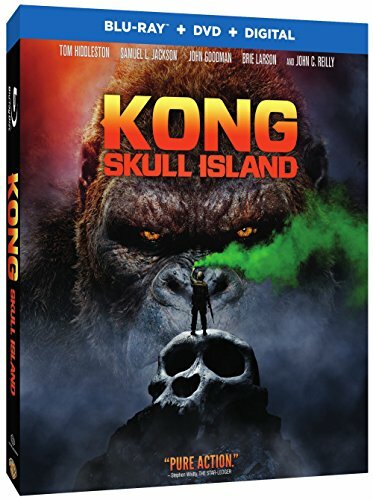 A spin-off, Son of Kong, was released later that year, thereby launching an enduring franchise which would serve over the intervening decades as a wellspring for a profusion of scintillating sequels and remakes. Kong: Skull Island is a refreshing reboot of the original co-starring Samuel L.Jackson, John Goodman, Brie Larson, John C. Reilly and Tom Hiddleston. The film features a large ensemble cast in accordance with the demands of a typical horror flick with a high body count. It was directed by Jordan Vogt-Roberts who made an impressive debut in 2013 with the coming-of-age comedy The Kings of Summer. A riveting origins tale, this special f/x-driven adventure unfolds in the Seventies, near the end of the Vietnam conflict. At the point of departure, we find thrill seeker Bill Randa (Goodman) pressuring a U.S. senator (Richard Jenkins) to underwrite a perilous trek to a godforsaken Pacific island permanently surrounded by treacherous storms blamed for the mysterious disappearance of countless boats and airplanes. Once the ill-advised caravan is approved, Randa hastily assembles a ragtag crew composed of an intrepid photographer (Larson), a nerdy geologist (Corey Hawkins), a brainy biologist (Jing Tian) and a cowardly bureaucrat (John Ortiz). The team is escorted on its appointed mission by a squadron of Vietnam veterans led by salty Lieutenant Colonel Preston Packard (Jackson). As the convoy of choppers approaches Skull Island, the screen is cluttered with more characters than you could possibly keep track of. Not to worry. Soon enough, they start getting picked off in creative fashion by an army of gargantuan, primordial beasts. It's man versus monsters in a struggle to survive an anachronistic hellhole that time forgot. Stick around all the way till the very end of the credits and you'll be rewarded with an extended postscript setting up Godzilla vs. Kong, a sequel already slated for release in the spring of 2020. Blu-ray/DVD Combo Pack Extras: Deleted scenes; director's commentary; On Location: Vietnam; Through the Lens: Brie Larson's Photography; Tom Hiddleston: The Intrepid Traveler; Monarch Files: 2.0; Creating a King: Realizing an Icon; and Creating a King: Summoning a God.